The Navigator is somewhat of a star among Lincolns. However, while it's often the selected vehicle of celebrities and politicians, it's equally enjoyed by American families who desire luxury features, space and comfort. Expanding on the subject of space, this SUV offers plenty of it no matter which version you purchase. The 2016 Lincoln Navigator in Dallas-Fort Worth is available in two primary models - one with a standard wheelbase and one with an extended wheelbase (L). Both the Navigator and Navigator L come standard with second-row captain's chairs, but there's an optional second-row bench that can accommodate three passengers. The third row is easy to access in either case. 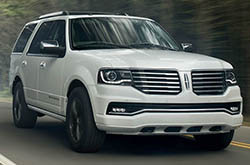 The Car Connection's 2016 Lincoln Navigator review says you'll like this car if "you crave a big, brawny, premium SUV that can tow up to 9,000 pounds," which brings us to the SUV's next highlight: power. The Navigator comes outfitted with a 3.5-liter turbocharged V6 engine that produces 380 horsepower and 460 pound-feet of torque. Rear-wheel drive is standard, as is a six-speed automatic transmission. As far as its strong towing abilities, Navigator outperforms many of its rivals according to Edmunds.com's 2016 Lincoln Navigator review. So, if you're in need of a luxury SUV that's also ready for adventure, it might be a good match for your lifestyle. Just like features under the hood, content in the cabin is also excellent. The Navigator and Navigator L are broken into Select and Reserve grades, both of which come appointed with amenities that'll speak to your needs. 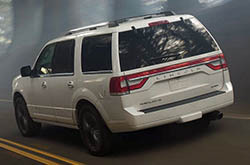 If you purchase a 2016 Lincoln Navigator in Grapevine and choose the Select grade, your SUV will come with a power liftgate, heated and ventilated front seats, leather upholstery, front and rear parking sensors, Bluetooth connectivity, navigation and much more. The Reserve adds to this list with additional features like adaptive suspension dampers, larger 22-inch wheels and higher quality leather. 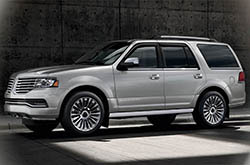 Visit Grapevine Lincoln if you'd like to test drive a 2016 Lincoln Navigator in Dallas-Fort Worth! To learn more about the SUV please see below. Compare LINCOLN's newest model of the Navigator to its rivals and we're sure that you'll choose it over vehicles like the 2016 Cadillac Escalade, Mercedes GL Class and the Infiniti QX80. The Navigator's got several appealing attributes, including its state-of-the-art cabin amenities and pronounced styling. It's a fantastic value, which you'll undoubtedly see when comparing its price to the opposition. Look over our Navigator Facts list; look just underneath this text for bullets. Thank you for reading Grapevine Lincoln's 2016 Navigator review! Stop worrying about your next purchase; look to the well-known Navigator dealership in Grapevine for well-researched reviews authored by automotive enthusiasts. Make good decisions when it comes to your next auto purchase - don't take guesses! Each section is overloaded with material and vehicle features in a clear layout that's easy to understand. Please visit our LINCOLN review and compare archive if you feel the Navigator is not tailor made for you; there you&ll learn about Grapevine Lincoln's entire lineup.